On January 15, 2011, I posted some pictures of a fossil I thought was some sort of Silurian clam. The shell was asymmetric which led me to believe it was not a brachiopod. 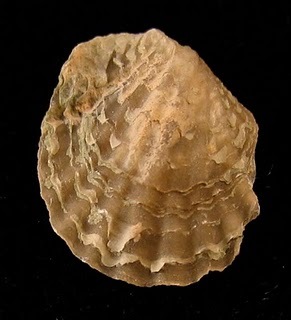 After studying more of the work of two researchers at the New York State Museum, Charles E. Beecher and John M. Clarke I now believe it could be the Atrypina disparilis brachiopod. Fossil was found in the Waldron Shale of Clark County, Indiana. They originally called it Coelospira disparilis Hall 1852 but later used the other name. As for the asymmetry, under Abnormalities they write, "A variation in adult shells, noticed only in rare instances, is a tendency to an asymmetrical development in the plications, as shown on plate 5, figure 18, where, by unequal growth upon the lateral portions of the shell, the median plication on the dorsal valve is deflected to one side, and the corresponding median sinus on the ventral valve displaced, the axial line of the shell being occupied by one of the strong plications bounding the sinus." Yikes, that was one long sentence! Now after making this identification, I place a 50% certainty on it. Another explanation is this is a fragment of an Athyris reticularis brachiopod. Maybe part of one of the fossil flaked off as a thin layer which fooled me into thinking it was a smaller brachiopod. The next image is Plate 5, figures 17-19 from the Memoirs of the New York State Museum Volume I Number 1 October 1889 entitled The Development of Some Silurian Brachiopoda by Charles E. Beecher and John M. Clarke. See my original images and text: (Click here to see post).